Do You Hate These Online Advertising Techniques? Do you sometimes think that some advertisers and marketers have lost their mind? Click on the animated cartoon below and watch it happen. Consumer Reports WebWatch's Own Reputation At Stake? Recently I posted "Consumer Trust Eroding In Web Sites? which, among other things, promoted the 10/26/05 C.R. WebWatch Conference on "Trust or Consequence: The Web's Reputation at Risk". I did this because I believe in their overall mission to help all online consumers and users. This, in turn, will help bring long term buyers together with ethical and value driven sellers, in my opinion. But, any chain is only as strong as its weakest link. So, when I read "Temple: Trust Must Be Earned Not Endorsed" by a RockyMountainNews.com columnist, John Temple, the title caught my eye, as I've posted a lot about TRUST. It turns out that Mr. Temple got a letter from Consumer Reports WebWatch that said: "DEADLINE LAST-CHANCE NOTICE: This ad goes to press immediately. Please note that we need your feedback within the next five business days regarding the placement of your brand name. There is, of course, no charge for this." But, what follows is interesting. In my previous post, "P&G's "Stealth Division" Corporate Ad Speak", the terminology, jargon, or semantic of "Buzz Marketing" was used. I look at that term as an overall concept that can, but not necessarily, encompass ethical Word Of Mouth Marketing, or even unethical Stealth Marketing (aka "Undercover Marketing"). However, there is much confusion over the meaning and use of the term "Buzz Marketing". This is due, in my opinion, to many articles like this 7/30/01 Business Week Online one, and online definitions like this one. On 5/17/05 an author on this subject published "Five Common Misconceptions About Buzz Marketing" in which he says: "If you're confused about the terminology of word-of-mouth marketing, I have a little confession to make: sometimes I get confused about it myself." All this serves to make many people mistakenly and automatically equate "Buzz" with "Stealth". But, "Buzz" can be ethical and serve a very positive, non-deceptive purpose for the consumer. Without going into too much detail for now, the "devil is in the details" when it comes to how "buzz marketing" is implemented, encouraged, facilitated, and followed up on. How "The Influentials" are chosen, educated, motivated, facilitated, and directed, especially when it comes to appropriate DOWNSTREAM DISCLOSURE of HOW THE VIRAL MESSAGE STARTED throughout the entire "pass along", "relay", or so- called "downstream" process is crucial, IMO. Consumer Trust Eroding In Web Sites? Since buyers and sellers of anything can't come together PROPERLY without a certain amount of TRUST, I am doing this post. I just received my "last chance notice" for continuing FREE Registration for the Consumer Reports WebWatch Conference: "Trust or Consequence: The Web's Reputation at Risk". It will be held on Wednesday, October 26, 2005, 8:45 a.m. – 3:45 p.m. at The National Press Club - Ballroom 529, 14th Street NW Washington, D.C.. The "intro" to it says: " Results from Consumer Reports WebWatch's national poll of U.S. Internet-savvy adults reveal trust in Web sites is under constant attack and showing signs of eroding. This is real data on changes in public perceptions of news and information Web sites, children's sites, financial services, and credit card use." "Most Internet Users Naive About Search Engines"
In order to bring long term buyers together with ethical, value driven sellers, there needs to be an educational process happening on the part of both. So, if you click on the cartoon to better read the caption, you will see that search engine users can have some naivety regarding a search engine's capabilities. But, maybe the cartoon is not too far fetched. The development of artificial intelligence is being worked on by many search engines. If the "Personalization" goal is achieved, its Consortium says it will: "Better serve the customer by anticipating needs." Today Mike Grehan wrote an article for ClickZ entitled "The SEO and the Blacksmith". Near the end of explaining how SEO has evolved, he says: "Not only that, a top ranking position is becoming more important as search engines test new methods of presentation, and organic (or natural) results are forced further down the page, below the fold." I thought this part of his article and what followed was a perfect follow up to my last post "Advertising and Mixed Motives" as he then said: "Today, I searched for the Beatles' "Sergeant Pepper" album at Google, which is now testing images folded into the top results. As my colleague Greg Ives points out, with three paid results at the top of the pile at Google (try a search for "halloween costumes") and often with some Froogle results thrown in at the top (and maybe even some news results), that all important top 10 hit is rapidly becoming an all important top 5 hit just to be seen." (In case "halloween costumes" only shows 2, try "Sponsored Links"). Advertising can be a "sneaky dude" as the animated image shows when you click on it. When Sergey Brin and Larry Page (Google Founders) were at Stanford University they wrote "The Anatomy of a Large-Scale Hypertextual Web Search Engine". Near the bottom of this college paper that presents a prototype picture of Google is Section "8 Appendix A: Advertising and Mixed Motives". 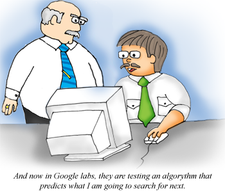 Sergey and Larry say: "Currently, the predominant business model for commercial search engines is advertising. The goals of the advertising business model do not always correspond to providing quality search to users." They go on to say: "..we expect that advertising funded search engines will be inherently biased towards the advertisers and away from the needs of the consumers." While I'm taking these quotes a little out of context (please read the entire section), and I don't think they were promoting or condoning this potential probability, they do provide their opinions about advertising on search engines. 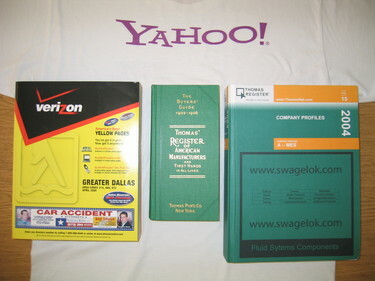 The photo above (click to enlarge) gives a better perspective of the larger amount of content that was indexed from 1905 to the eventual 16 large volumes of books in 2004 for the national, industrial B2B buyer's guide, and the thick local Yellow Pages book for B2C consumers. Of course, there were many Yellow Pages books all over the U.S.. But, what the photo doesn't show are the 19.2 billion pages indexed, that Yahoo recently claimed. Of course, a search engine's search algorithm is designed to cut through all that potential clutter, and present the most relevant results first in an online search. But, what is relevant to one person is not relevant to another or, potentially, even that same person at a different time. 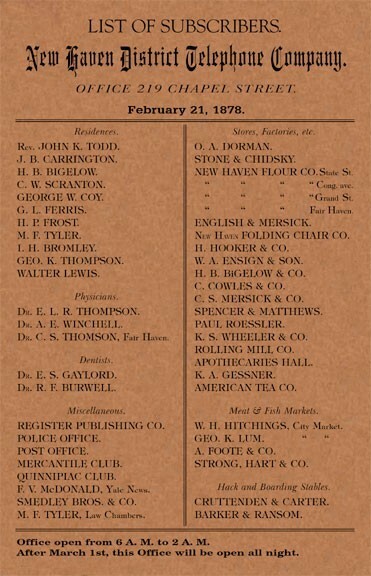 Thanks to Larry Small, Director of Research at the Yellow Pages Association, I now have a photo of what the "First Directory" looked like in 1878! This is interesting as the About.com page on The History of the Yellow Pages says that "The very first time the term yellow pages was used was in 1883. A printer working on a regular telephone directory ran out of white paper and used yellow paper instead." In 1886 Reuben H. Donnelley created the first official yellow pages directory. Be sure to "Click On Photo To Enlarge" to better see the date of the 1st Edition reproduction of "The Buyers' Guide" that I marketed off-line and online advertising in for many years. Of course, when my independent contractor, publisher's rep firm represented that publisher, the print version was much larger as seen partially on the right. The "Yellow Pages" got its start in 1886 by Reuben H. Donnelly. 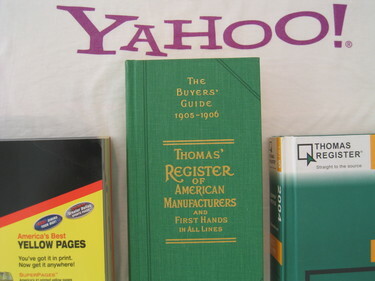 Yahoo's online only history started in 1995, but their "human editor" directory search engine has a lot in common with both other publications when it comes to relevance. "Relevance" is defined in Wikipedia by three keywords: "pertinent", "connected", and "applicable". The antonym of relevant is irrelevant. A good example of an irrelevant ad is in the above "Yellow Pages" link to an About.com page with a Microsoft Office Small Business Accounting 2006 Flash Ad. You may not be able to see the same ad, so I'll describe the situation; I accidentally rolled my cursor over the "Roll over to replay" text, and it took me to another flash ad that had an "X" box to cancel. But, instead, that deceptive icon took me to Microsoft's landing page to sell me. This annoyed me as my intent in going to that "Yellow Pages" About.com page was not to buy accounting software. The ad was totally unrelated to the matter being considered!